River Surfing: a moving water adrenalin rush! River surfing can be a fast water ride or a fun technical challenge depending on the current and size of waves. It's not for everyone; it takes a degree of fearlessness, strength, endurance, stamina and of course excellent balance. Surfing on rivers is on the extreme end of stand up paddling disciplines, a true rush for those who take up a river paddle board to ride the current. A river can be a wild thing, and this kind of surfing means knowing what you may encounter. From a safety standpoint, it’s important to know the lay of the river, including submerged objects such as rocks, pilings, and deadheads, as well as characteristics of the river, from gentle flow to rapids. 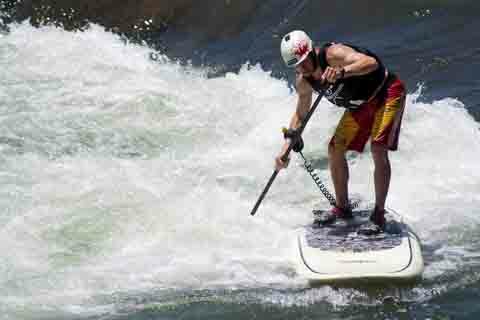 Understanding the river you’re on is essential to SUP safety. Another phenomena that presents unique opportunities for surfing on rivers are tidal bores, which occur in relatively few locations worldwide, and usually in areas with a large tidal range. Incoming tides are funnelled from a broad bay into a shallow, narrowing river via a broad bay. What you get is a sudden increase in the water level--and for some, surf heaven. Check out the videos below, and see get ready for a vicarious adrenalin rush. There are some wild rides here! 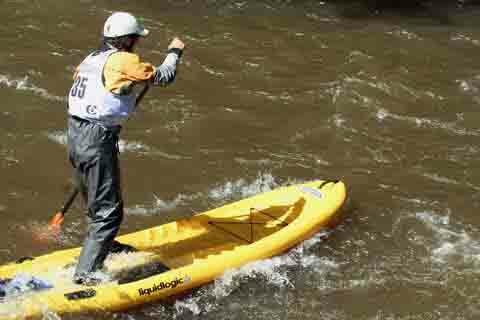 Badfish gives excellent insider information about using specific fins for river SUPing. Talking passionately about white water river paddling and how competition is absorbing the sport. Riding the waves of the Potomac River, Washington DC, U.S.A. - That's real river surf. River surfing at Skookumchuck Narrows, B.C. Fun video from Nakhon Nayok rapids near Khao Yai National Park, North East of Bangkok. Looking for more rush? Check out SUP downwinders.